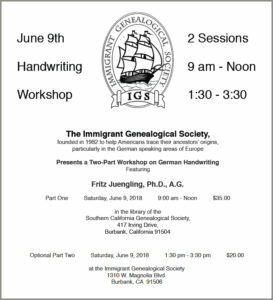 Presenting a Two-Part Workshop on German Handwriting! Featuring Fritz Juengling, Ph.D., A.G.
Space is Limited and almost Sold Out.. please email us at events@immigrantgensoc.org before registering! Download the Handwriting Workshop flyer for more details and registration info.